As it turns out, Jon Moore’s thirst for knowledge led to a thirst of a different kind. While studying toward his doctorate from Tulane University in history of the British Empire, he traveled with Diana Powell to Europe, Australia, and New Zealand to do research. Along the way the couple developed an appreciation for hard cider. 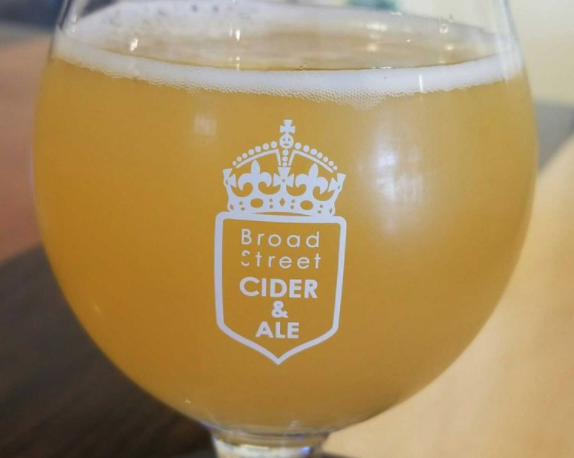 That led them to open Broad Street Cider & Ale, the only dedicated cidery in New Orleans. The place began operations in July, and it produces a dozen varieties of cider, which is derived from fermented apples. He went on to say that cider production is not unlike wine-making, but that he also employs techniques employed in the production of craft beers — i.e., using different types of yeast to produce different flavors. The juice that he uses is imported from the Pacific Northwest, then heated to 60 to 70 degrees in Broad Street’s small on-site production room. Fermentation takes even to 10 days, and then the cider is placed in kegs for two to three weeks during the secondary fermentation phase, when natural carbonation occurs. Broad Street also features beer and wine from other producers. And while other New Orleans establishments — notably Cooter Brown’s Tavern & Oyster Bar, The Crown & Anchor, and Three Muses — also serve cider, it is the only one devoted exclusively to the practice. From both a local and tourist perspective, the new taste of New Orleans’ bar scene is yet another draw to one of the most enchantingly eclectic food and bar scenes in the world.